How I had never heard anyone snore so loudly in my entire life, and how badly I wanted to release my body of the pretzel it had been in for the past seven hours. And not the soft Auntie Anne’s either. But the ones you buy in a bag that are stiff and break upon snapping. “What am I doing here?,” I thought as I reflected on the craziness of my journey after spending the past 2 weeks backpacking in Costa Rica. Then I remembered what I was doing on a bus to Panama, and a wave of nervous excitement washed over me that made it all worth it. Later that day I would be meeting ten other dance diplomats from all over my home country of the United States to engage in a Movement Exchange. 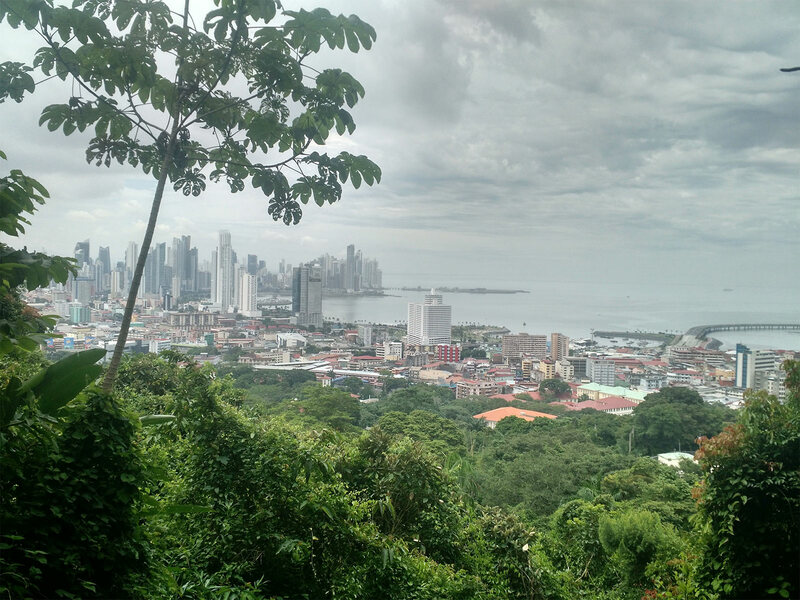 After napping for a few short hours on a couch in the lobby of the hostel where we would be staying, I let my energy drive me towards exploring Panama City before the rest of the crew arrived. As the day went on, I was continuously touched by people I encountered on my solo adventure towards Cerro Ancon, a nature reserve that we would enjoy as a group later in the week. One of them was a man living in the hostel with Parkinson’s disease. After learning about what I was there for, he told me about how much movement has helped him with his terminal illness. While at one point he could barely get out of bed, he says that now it’s all he can do to move his body so that he will continue to be able to move it. After that point, every conversation we now have is about music and the importance of dance. The other friends I made came about as I had gotten lost on my way to the park. Long story short, I ended up receiving papayas, bananas, and mangoes from them (a few days breakfast for a frugivore like myself!! ), in addition to lots of laughs, and dancing in the street. In a country where I don’t speak the language, communicating bits and pieces with natives is how I learn the most. And besides, dance doesn’t need a spoken language for it to be affective. Finally, it was early evening and time to meet the fellow diplomats that I would be bonding with for the rest of the week. After dinner together, we got together in a studio to start moving as a group. And let me tell you, there’s nothing like music and dance to break the ice and get us pumped for the week. We spent a bit of time reflecting on the week ahead and again the question came up for me, “What am I doing here?” I found the international exchange through an email from my dance department at Virginia Commonwealth University. I had been searching for an opportunity to dance abroad for much of the school year, but no program caught my eye like Movement Exchange did. Through teaching at orphanages and collaborating with local university students in Panama, I would get to combine my passion for youth, teaching, and dance, while challenging myself through the lens of a foreign culture. Plus much of the program costs would go towards benefitting the mission of the program year round. I was sold. So basically, that’s what I’m doing here. I recently realized that my relationship with dance draws towards being service oriented. While I love performing and choreographing, my true authentic self is most fulfilled by sharing dance with others and rejoicing in the power of it to bring out the qualities that unite us all as human beings. With all that being said, let’s get this week started!